Think boiler warranties are only interesting to, well, boiler manufacturers? If so, you may be missing out on a nice income stream. Longer boiler warranties can actually bring more profit for your plumbing business. 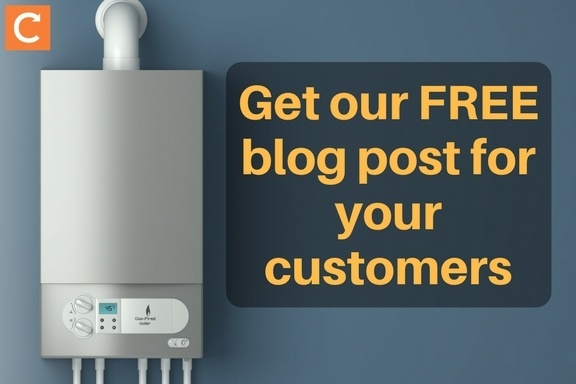 That’s why we created this free, customer-friendly post that explains how to choose a boiler, including information on extended warranties. Need ideas on how to use the tamplate? Use it as a blog post and email the post link to your customers. Post it as a downloadable PDF on your website or social media accounts. Have the template printed out to give to customers in person. We hope the post helps you get more customers—and more jobs. You've had your old boiler practically forever. It's on its last legs—er, gaskets—so you'll need a new one soon. Boiler technology has changed tremendously since you likely bought yours ten or more years ago. Combi boilers are on the scene, boiler installers are sizing boilers more correctly to your home (instead of upsizing them 30% as in the past), and it's now mandatory for all gas and oil boilers to be condensing boilers. If this all sounds confusing, don't worry: We have some useful (and sometimes surprising) advice on how to choose just the right boiler for your home. You used to have two choices of boiler, and now you have three. Here are the details on each type, including whether it will work for your home and family. What it is: These sealed systems heat water directly from the mains, meaning you don't need a hot water storage cylinder or cistern taking up space in your home, and the water is delivered at mains pressure. Good for: Small families. Combis really work best when asked to provide heat for one need at a time. So if you have several family members and need to be able to run showers, washing machines, and taps at the same time, a combi boiler is probably not right for you. What it is: Like combi boilers, system boilers are sealed systems, but they store hot water in a cylinder. What it is: Conventional boilers are open systems, meaning they require a cistern. Homeowners often choose this type of boiler as a replacement for a system that has a cistern in the roof space. Like system boilers, they store hot water in a cylinder. Good for: Those who have larger families and/or want "power showers." As with system boilers, you can get a nice flow rate out of several taps at once. However, conventional boilers are more expensive to install and, since they require a cistern, take up more space. Ready to start shopping? Let’s talk about how to choose the best boiler model for your home and budget. Not all boilers are made equal. You’ll need to do some research to find out which boiler brands and models live up to the hype—and which you should skip. At BoilerGuide, you can compare up to four models and get info on different models' efficiency rating, standard warranty, mounting, and cost. Another (more technical) option is the Product Characteristics Database, which lets you search for boilers specifying the fuel type, brand, and more. For each product, you'll find details on its efficiency, dates of manufacture, and other helpful information that can help you choose. You probably know that the best way to find a new hairdresser is to ask someone whose hairstyle you like. Well, the best way to find a new boiler is to ask your friends with similar-sized homes and families how satisfied they are with their systems. Ask them how long they’ve had the boiler, whether they’ve had any problems with it, and how often it needs to be repaired. Expand your reach by asking the same questions of your connections on Facebook, Twitter, or other social media. People love offering advice on products they like and dislike, so you’re sure to get some good feedback that can help you make a decision. Reading reviews from actual boiler owners can give you valuable information on a boiler’s quality and the manufacturer’s customer service, and alert you to any red flags. Once you've narrowed down your list to two or three, plug the model name or the manufacturer's name into Google to find out what users are saying about them in the Google Reviews. For example, one boiler manufacturer has two out of five stars with 23 reviews, with comments like "appalling service" and "budget boilers with a 2-year warranty that break after 3 years." While you shouldn't rely 100% on consumer reviews, they can be one more tool in your boiler research toolbox. Found the boiler of your dreams—the one that will supply you and your family all the hot water you could ever want? Be sure to choose an installer and a warranty that will keep this expensive piece of equipment running well for a long time. Once you buy your boiler, be sure to register it with the manufacturer so they can easily track when and where you bought it. This will come in handy if there’s a problem with the boiler while it’s still under warranty. All boilers come with a one-year warranty. Looking for even more headache-free years? You can often purchase an extended warranty of anywhere from two to ten years. If you opt for a longer warranty, your boiler will need to be serviced every year to make sure the warranty stays valid; however, your boiler should be serviced every year, including a gas tightness test, in any case to keep it safe and running at peak efficiency, so this shouldn’t be a problem. The boiler warranty may specify who can work on your system, so read through the warranty information. If you have a gas boiler, choose a Gas Safe installer, which is an engineer who’s legally permitted to carry out gas work. You can check the Gas Safe Register to find certified installers. Finally, keep your purchase and maintenance records, including the boiler serial number, in a safe place in case you need to have the boiler repaired. We’re here to help you choose the right boiler, get it installed properly, and maintain it so it stays safe, runs efficiently, and gives you and your family many years of trouble-free hot water. Just give us a call or send an email if you have any questions or would like to schedule service. Ready to download "How to Choose a Boiler" so you can use it in an email, on your letterhead, and more? Just click on the banner below!